The Lowepro ID, Badge, Press Pass or Passport holder with neck strap is not only for Lowepro enthusiasts. It is the perfect addition to your travel luggage, take it while hiking, or on your next cruise when you don't want to be bogged down with a wallet or purse. Modern, urban and versatile, it will carry your credit cards, drivers license or passport while you travel. It is made with Cyclepet by Lowepro, a 100% post consumer, recycled fabric, equivalent to 3.5 to 22 PET bottles. Two small convenient pouches on the back will carry chapstick, lipstick or currency, It has the Lowepro logo. Includes a blue ink Lowepro pen, a see through plastic waterproof pouch keeps items visible and dry. 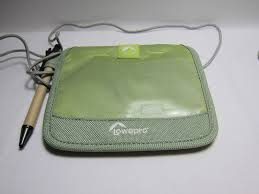 It has Lowepro quality stitching and the popular Leaf Green color. It also includes a neck strap and accents in gray.